Justice League is undergoing a significant roster change that might result in Superman's nemesis running the team. Lex Luthor has been many things during the long history of DC Comics. Mad scientist. Corporate mogul. President of the United States. Now the Superman villain has his sights set on yet another influential position: Leader of the Justice League. As the events of DC Comics' Forever Evil draw to a close, Luthor will find himself thrust into the ranks of Earth's superpowered champions, awarding him a League membership alongside Batman and Wonder Woman. "Is he going to lead the Justice League?" series writer Geoff Johns told the Washington Post. "It depends on whom you ask on the team. Certainly, he thinks he should." Luthor can definitely expect resistance from founding members like Batman, but after the events of Forever Evil tarnished the League's reputation, respectable heroes might not get a say in the matter. Leader or not, Luthor will still become a public defender after helping defeat the powerful Crime Syndicate. With the intelligence, power armor, and personal wealth to act like an evil version of Iron Man, Luthor's presence in Justice League should mark a significant change in how the team operates. 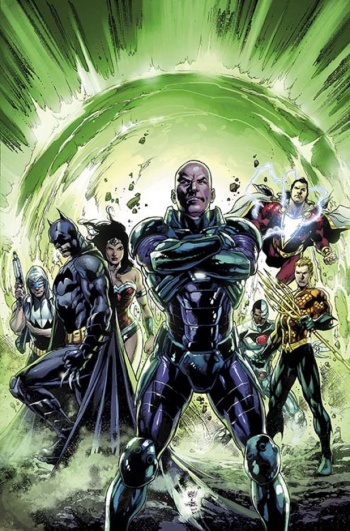 Outside of Luthor, the post-Forever Evil roster includes Batman, Wonder Woman, Aquaman, Shazam, Cyborg, and another "reformed" villain named Captain Cold. So far, Superman is unavailable for comment. Based on Johns' outline, this storyline bears some similarity to Dark Avengers, a Marvel series in which Norman "Green Goblin" Osborn took control of the Avengers and replaced them with supervillains. What's interesting is that unlike Dark Avengers, Luthor will be working alongside superheroes for a greater good. Johns notes that Luthor's addition to the League blurs the lines between good and evil, and that as a hero, Luthor may find himself on the defensive from fellow villains. "I think the most interesting thing is that Lex doesn't realize what it's like to be a super hero, what the life is like." Johns explains. "You make enemies, they attack you on a personal level. And he's just Lex Luthor. He has no codename, no mask ... He has to deal with the ramifications of that." If this storyline is like anything else in comics, the Justice League's latest addition will probably be kicked off the team in a year or two. In the meantime, I'll admit that handled correctly, this could be one of the most interesting superhero shake-ups to come out of the New 52 yet. Luthor's addition to the League is expected to happen by Justice League #30, due out this April.